The Fountains of Lake Pointe Woods was honored to be able to host The famous Chorus of The Keys on January 12th. The Chorus of The Keys proudly presented their 70th Annual Show at The Fountains with over 30 quartet members. 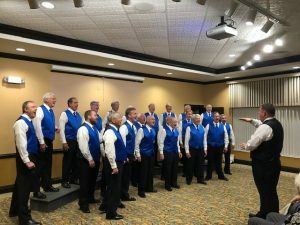 The Chorus was directed by International Gold Medal Winner Drew Kirkman, and they recently placed second in a statewide competition of men’s choruses. The Chorus is Sarasota’s oldest arts group, having been formed in 1949. We were taken back in time by their classic barbershop songs, broadway tunes and stirring patriotic favorites.